This beverage is so rich and delicious, it’s like have warm apple pie in a glass! Pour apple juice/cider into a medium saucepan and heat on a low setting for about 2 minutes. Stir in brown sugar, maple syrup and pumpkin pie spice. Heat until steam rises out of the pot (do not boil), and the sugar has melted (about 3 minutes). Remove from heat and add butter, stirring until melted. Pour cider into heat-proof cups, top with whipped cream, and serve with a cinnamon stick. This delicious recipe makes 4 – 1/2 c servings. Fran’s World of Discovery has created an apple resource page filled with links to other apples sites and videos about apples: How to make an apple puzzle, the health benefits of apples, and how apples grow. This yummy recipe is an example of one of the activities that can be found in the Johnny Appleseed ebook written by Fran Wisniewski. Click on the link above to learn more or click on the link below to purchase. 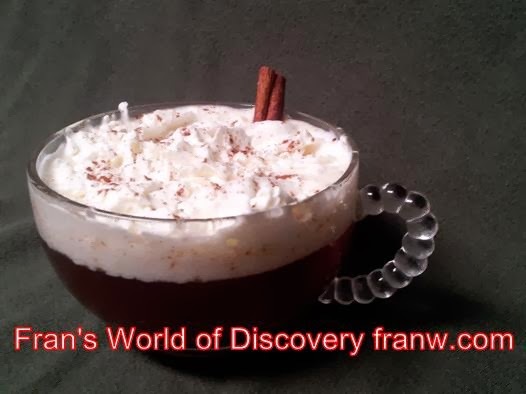 Note: Has this or another activity on Fran’s World of Discovery inspired you or someone else in a positive way, or have you featured this activity in a blog post? I invite you to comment and link to back where your post can be found, or tell me what you or your family enjoyed about the post! Thank you!